"IAM' in a triangle in runouts denotes a pressing. With 24-page book bound to center of gatefold. 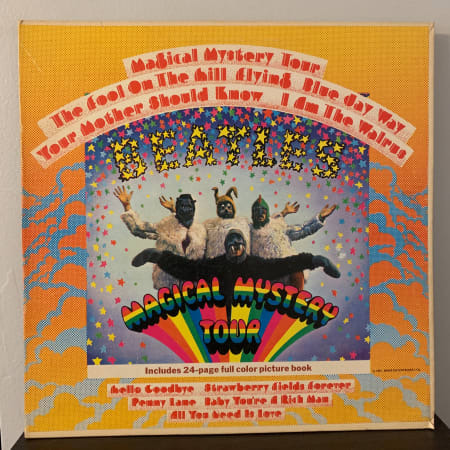 Original issue has ("No You're Not" said Little Nicola) under the "I Am The Walrus" title inside the gatefold sleeve in block print and not cursive as in later issues. Orig Colorband label. Booklet detached but all there. Vinyl is in VG condition with surface marks that cannot be felt. Cover is in VG+ condition with normal shelf wear and a small split on the front top right corner. Booklet is in tact. Vinyl has been tested prior to listing and plays great! Original 1967 first US stereo pressing. Solid black labels with silver text and Capitol "rainbow" rim. Gatefold jacket has only minimal wear except to the corners and top seam. Record still shines but with heavy wear and several scratches that may affect playback. Overall an excellent collector's copy. Shipped next-day in damage-proof packaging.